On 30+ quiet, secluded acres in Grant County, just off Highway 180 only 2 miles East of downtown Silver City. Rose Valley RV Ranch is located off US Highway 180 on Memory Lane. Check for road conditions on your cell phone by calling 511. This is a service provided by the New Mexico DOT. 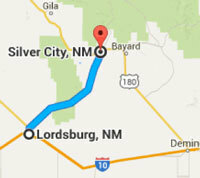 Hwy 90 from Lordsburg to Rose Valley is a 50 minutes drive. Now until mid-2016, note that the bridge entering Silver City is under contruction on Hwy 90. Take the first detour onto By-Pass Road to Hwy 180. 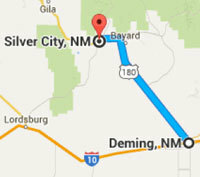 Hwy 180 from Deming to Rose Valley is a 50 minutes drive.